Sunday March 17, 2019 • 1 p.m.
We would like to thank you for taking the time to check out our website. 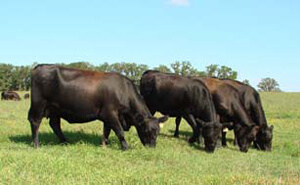 We are a family owned and operated Angus seed stock operation located in central Minnesota. 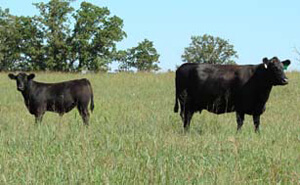 We have been in the registered Angus business for about 20 years with about 30 years of total cow calf operation experience. 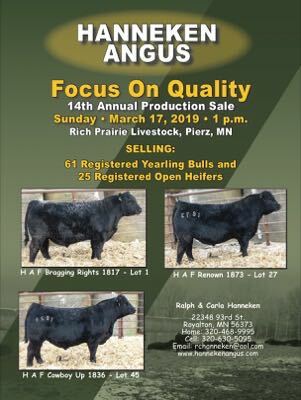 We will be hosting our 14th production sale in March of 2019 with previous private treaty sales. Our main focus is to produce high quality seed stock for our customers ; purebred and commercial alike, to make a profit for all players involved. We strive to raise problem free cattle with good disposition, moderate frame size and outstanding carcass and female qualities. 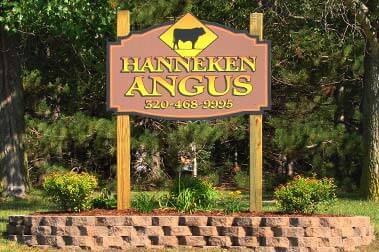 When you purchase cattle at Hanneken Angus you deal with the owner, the man that does most of the work, the man that calves all the cows, raises the feed and delivers the cattle to your door. We are very proud of our cattle and especially the honesty and integrity with which we do business. We stand behind our cattle 100%. No matter where you buy or what you buy you will have some problems with an individual now and then. Its the operation that stands behind their product that I like to deal with. Check out our sire lineup for our 2019 sale and beginning in January 2019, watch for updates on our website about the bulls and females selling in our March 2019 sale. All sale cattle are genomic tested. We stand behind our product. Again thank you for showing interest in our cattle.